Samsung Galaxy A has just unveiled a long-awaited Galaxy A80 smartphone with a slider. Below is the full specifications and all you need to know about the smartphone. The use of diamonds, slider, and selfie slider cameras are all about the efforts of the world's largest mobile phone companies to make the most of the screen and integrate it recently. 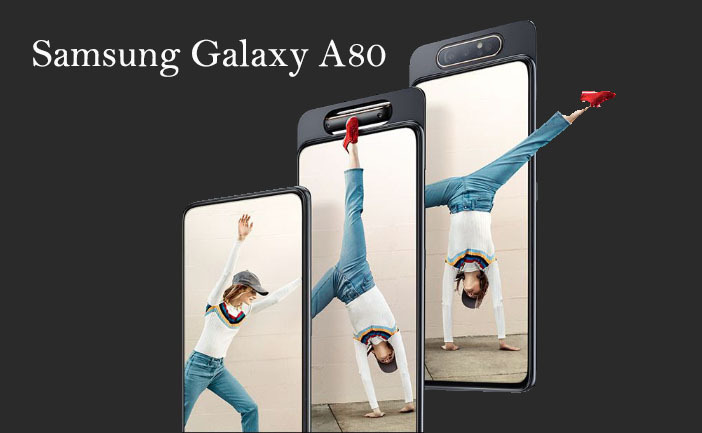 Now with Samsung's A80, the Galaxy A80 has put all these efforts behind it and uses the slider panel that has a triple camera, a 6.7-inch Super OMOLED display with a fully integrated 1080 x 2400 pixel resolution. Laid down. The coolest thing Samsung has been offering on the Galaxy A80 is the slider and turntable. In fact, in the slider panel of this handset there is only a camera with a 48 megapixel lens with f / 2.0 aperture and an 8-megapixel lens with f / 2.4 shutter release and a TOF camera. Interestingly, these cameras are in a tiny section that spins perfectly, and thanks to the same rotation, it can play the role of a selfie camera. Samsung's focus on the Galaxy A Series phones is at least one of the most spectacular hardware specifications, a great camera and a good battery life, but the Galaxy A80 seems to have all three of these specifications. It comes with 8GB of RAM along with 128GB of internal storage. Although there is still no mention of the processor, we know that it comes with a 8-core processor (2.2GHz dual-core and 1.7GHz 6 cores). The specs together make the Galaxy A80 into a more powerful phone than an alternative. Samsung has equipped the phone with a 3700 mAh battery with Adaptive Power . Thanks to this capability, you can actually save energy by closing programs that you have not used for a while. Meanwhile, the Galaxy A80 is equipped with a 25-watt fast charging capability, so with all of these features you'll never be charged without charge.